RAILROAD.NET • View topic - What's Up with the Lowell Line? What's Up with the Lowell Line? So the other day, I noticed on the information panel in Winchester, a 20 - 40 minute delay due to "construction". I've also noticed that the cross street signals, and many others, have been constantly lit up, not just when there's traffic near by. And tonight I noticed a picture on nerail showing a re-routed Downeaster through Reading. So what is this mystery construction? And where is it exactly? Re: What's Up with the Lowell Line? l008com wrote: So the other day, I noticed on the information panel in Winchester, a 20 - 40 minute delay due to "construction". There were buses between Anderson-Woburn and Wilmington this weekend. So perhaps it was related. Wish I knew about the rerouted Downeaster trains. I only caught the Downeaster via Reading once, and that was by accident, so the pictures weren't good. Maybe it's just regular track work? What did the MBTA website say? In the description of the photo of the rerouted downeaster pic over on nerail it claims it was due to a culvert replacement on the Lowell line. There was a culvert replacement between Anderson and Wilmington. They also replaced some rail in Wilmington Station. And there was some work done just north of North Billerica station. The line had a bus bridge from Anderson Station to Wilmington with two train sets covering both ends of the line. Saturday the delays were anywhere from 40 mins to an hour, while Sunday delays were about 20 to 30 mins. Cross St Bridge Replacement coming up! October 17-18: Shuttle buses replacing Lowell Line service between Anderson and North Stations and Winchester and Lowell Stations from Saturday, October 17 through Sunday, October 18, from start to end of service. Buses will replace train service between North Station and Anderson/Woburn stations from start to end of service on Saturday, October 17th through Sunday, October 18th to allow for necessary railroad bridge replacement at Cross Street in Winchester. Train service will operate between North Station and Winchester Center, and between Anderson/Woburn and Lowell. 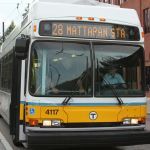 Outbound passengers traveling from North Station to Anderson/Woburn, Wilmington, North Billerica, or Lowell will board a shuttle bus to Anderson/Woburn for connecting local train service to Lowell. Outbound passengers traveling from West Medford, Wedgemere, or Winchester Center to Anderson/Woburn, Wilmington, North Billerica, or Lowell will alight train at Winchester Center and board a shuttle bus to station destination. Inbound passengers traveling from Lowell, North Billerica, or Wilmington will alight at Anderson/Woburn and board a shuttle bus to Winchester Center, Wedgemere, West Medford, or North Station. Please allow additional travel time as we are anticipating delays of approximately fifteen minutes. I presume the Downeaster will operate entirely via the Western Route. Nothing about the Haverhill line trains operating that way. Western Route all the way as well? That's interesting. Are they replacing it with a similar bridge, or are they raising it up some so fewer trucks get stuck? That bridge doesn't actually look bad, not that I've poked around up there Also I'm no bridge inspector heh. Rockingham Racer wrote: Nothing about the Haverhill line trains operating that way. Western Route all the way as well? All Haverhill trains already use the Western Route on weekends. The only ones that use the NH Main (Lowell Line) are weekday trains. I'd like to know how the Amtrak/Keolis conflicts will work. 1209 vs 698 is already messy as it is. I wonder if 1209 will hold at WJ, 698 will clear WJ on the Wildcat, then 1209 continues, and 688 will back off the Wildcat and proceed down the Western Route? BostonUrbEx wrote: I'd like to know how the Amtrak/Keolis conflicts will work. 1209 vs 698 is already messy as it is. I wonder if 1209 will hold at WJ, 698 will clear WJ on the Wildcat, then 1209 continues, and 688 will back off the Wildcat and proceed down the Western Route? A good possibility. I've been on a train that did just that. I worked 1209 last night. 698 held us up for about 4 minutes at WJ. But we were late from the 30 mph restriction from Oak Grove to Greenwood! I would be willing to bet next week if 698 is on time 1209' will sit at Ash St. If 698 is late they will wait on the Lawrence end. 1209/2209 will meet Amtrak 698 at CPWJ with 698 taking the Wildcat. 1210/2210/Amtrak 699/1211/2211 should not have any conflicts. This only if everyone is on time or there's no other issues. Also RBB&B Circus is in the TD Garden that weekend. No Fitchburg service and bus shuttles on the Lowell Line. Plus I think the Head Of The Charles Regatta is that weekend too!